In many applications, it is critical to know the presence or absence of liquid. An early indication, helps to prevent the loss of critical fluid, damage to equipment, costly service interruption and system downtime. That’s where SST Sensing Ltd comes in, with an affordable sensor to prevent the high cost of leaking liquids. 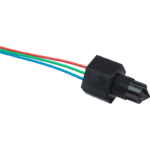 Designed for small spaces, SST Sensing’s single point optical liquid level sensors are a more reliable and durable alternative to float switches. How does this sensor work? When in air, the infrared light inside the sensor tip is refracted back to the detector. When in contact with liquid, the infrared light is refracted out of the sensor tip causing less energy to reach the detector. they have a long operating life, fit into small spaces and can very quickly react to small amounts of liquid. The liquid level sensors are solid state, so there are no moving parts to fail. Their ability to function in wide operating temperatures and a broad range of liquids results in a highly reliable sensor for use in many applications. Catching the issue at an early stage, adds value to the products and services by supplying end user confidence. for leak detection under flooring and within sumps, bilges and oil catch pans. And as low level indicators preventing run dry conditions for oils, hydraulants and coolants. 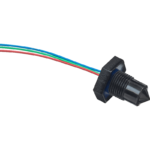 If our standard range of sensors do not meet your needs, our engineers will work with you to find the right sensing solution. Get in touch with us and ask the expert today! Designed to operate in aggressive environments due to their stainless steel construction and glass sensing tip.